April 10, 2019 - Charges have been filed against a suspect arrested in a fatal crash that occurred at 800 North Shepherd Drive about 9:35 p.m. on March 30. 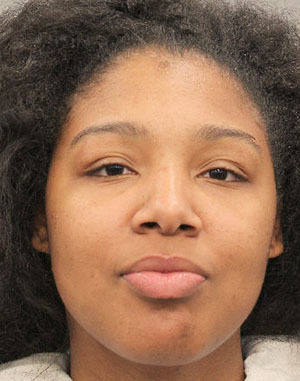 The suspect, Jada Mimms (b/f, 20), is charged with two counts of failure to stop and render aid (FSRA) involving death in the 183rd State District Court. A photo of Mimms is attached to this news release. The victims, Jesus Perez, 64, and Lesha Adams, 55, were transported to area hospitals where they were pronounced deceased. The driver (Mimms) of a blue Chevrolet Cruze was traveling northbound at the above address when her vehicle struck two pedestrians who were in the street. Mimms initially left the scene, but later returned. Mimms, who did not show signs of intoxication was questioned and released, pending further investigation. On Tuesday (April 9), Mimms was arrested without incident on the above charges.